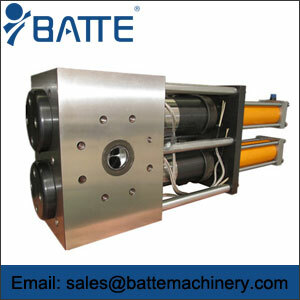 Screen changer, also called melt filter, is an indispensable equipment in the production of recycled plastic. The screen changer of extruder not only can filter various impurities, but more importantly, after installing the screen changer You can replace the filter without stopping the extruder production and disassembly mold; New mesh changer equipment developed by Zhengzhou, but also can be replaced without affecting the normal production of the product, reducing energy consumption, waste, cost and The labor intensity of workers has raised their productivity and economic benefits. When the screen changer filter pressure reaches a certain value, will be prompted by the warning lights, for network operations; for the network process does not leak material, which on the screen quality and manufacturing process made a very high demand. High-quality screen changer, first of all in the structural design to be reasonable, followed by the material on the choice of high-quality alloy steel; once again in the processing technology and precision to be accurate, the final assembly and commissioning experience to ensure the screen changer In the high temperature, high pressure state, no deformation, always maintain the precision with precision, long-term no leakage. Butter screen changers Domestic well-known brand manufacturers, to provide screen changer equipment include: plate screen changer, column screen changer, mesh belt screen changer, etc. They are suitable for granulation production, according to different working conditions And the production requirements to choose the screen changer.